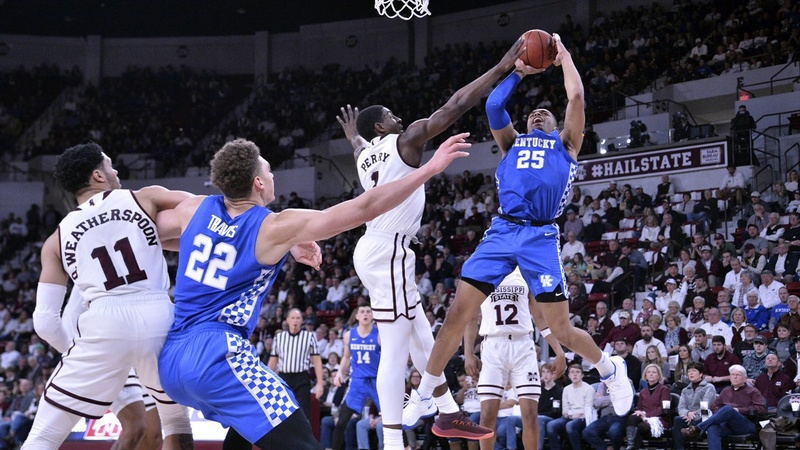 Kentucky and Mississippi State met in a battle of SEC foes on Saturday down in Starkville. Both Teams came into the game playing well, with the Bulldogs’ last rough outing being at Rupp. Over the past 2-3 weeks, P.J. Washington has become the star the Big Blue fanbase expected. He needed to continue his strong play in Starkville, Against Quinndary Weatherspoon and his ascending Dawgs. Much of the 1st half, UK and Mississippi St. played back and forth. From my perspective, I felt Cal’s Cats were in control in terms of the score. It started to show on the scoreboard, in the last 8-10 minutes of the half. The Cats headed to the visitor’s locker room leading 40-25 after a dominating stretch of play. The Cats continued to show improvement in many areas. P.J. continued to lead the way with 10 points and Ashton Hagans showed his playmaking skills with seven first-half assists. Lastly, the defense held a solid team to 25 points. At this point in the season, that is a pretty good accomplishment. After an early P.J. Washington three pushed the UK lead to 18, I wondered if I was witnessing a blowout in the making. However, a quick 7-0 run by Mississippi State quickly erased those thoughts. At the 15 minute mark, the UK lead was down to 11. Potentially more promising for the Bulldogs faithful, the home crowd was on its feet. How would the Cats respond? The immediate answer to that question was a resounding “Not Well”. The lead shrank all the way to three with 9:18 to play. Suddenly the efficient offense of the 1st half was generating more turnovers than points. The defense that had held Mississippi State to 25 in the 1st half had allowed 23 in just 10:42, since halftime. From there, the rest of the game was quite stressful for both fan bases. The Kentucky lead kept growing and decreasing back and forth. In the final few minutes, the Cats had the lead which forced some rushed plays by the Bulldogs and in the end, the Cats barely held on to a 71-67 win. Moving forward, the Cats will need to be focused for the entire 40 minutes if they expect to keep winning. Overall, a solid road win, with a sloppily done second half.